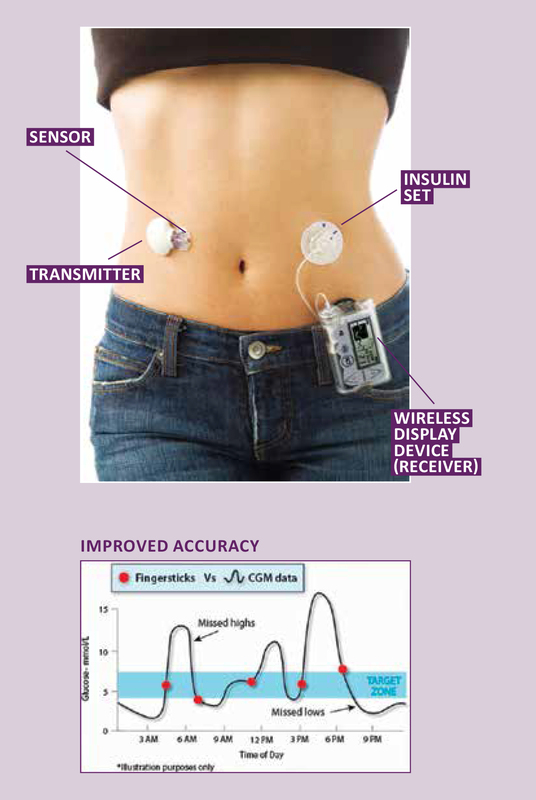 How do I access continuous glucose monitoring (CGM)? From 1 April 2017, the Australian Government will provide access to fully subsidised continuous glucose monitoring (CGM) products through the NDSS. Access to these products will be open to children and young people aged under 21 years, who face significant challenges living with type 1 diabetes, and who meet specific eligibility criteria, as assessed by an authorised health professional. Authorised health professionals: Endocrinologist, credentialed diabetes educator (CDE), and other professionals specialising in diabetes (physicians, paediatricians or nurse practitioners). . The choice of which specific device to be used is a decision of the authorised health professional in consultation with, and with the informed consent of, the person and/or their carer. 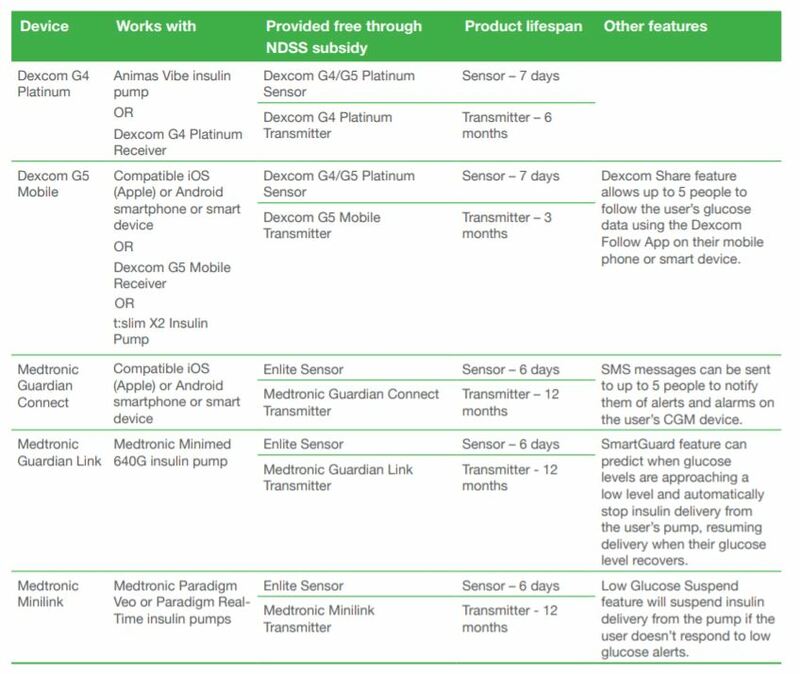 Please view the NDSS Device Summary and Compatibility Chart below for information about the devices subsidised through the NDSS, their compatibility with insulin pumps and smart devices and links to guidelines about appropriate use. The Government also intends to include the FreeStyle Libre flash glucose monitoring system on the list of products subsidised under the scheme. Negotiations with the product sponsor are ongoing and further information will be provided once negotiations are complete. 4. 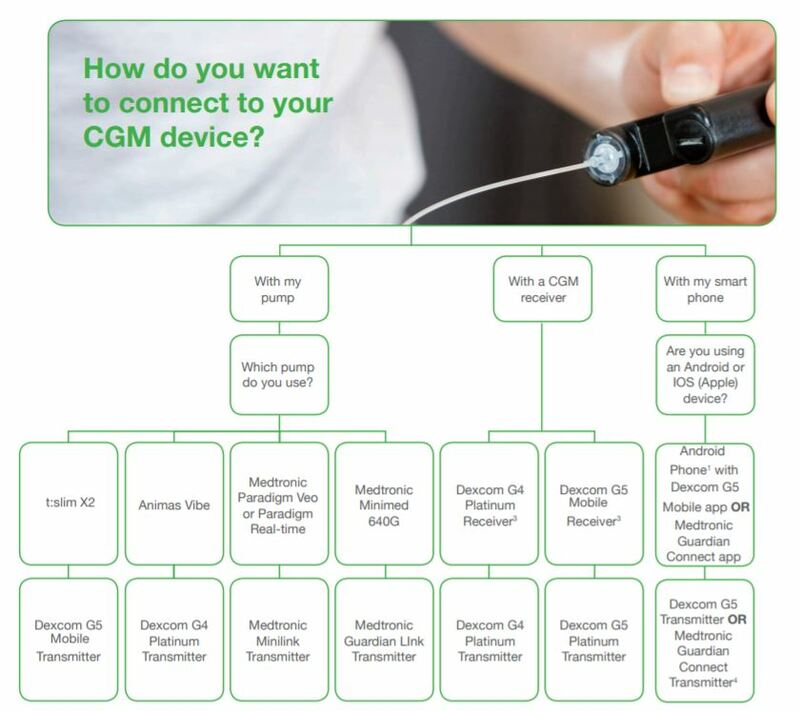 The Medtronic Guardian Connect and Dexcom G5 Mobile transmitters must be synced to a compatible Apple IOS or Android device with Bluetooth connectivity. After syncing the apps will function without cellular data or Wi-Fi connectivity. However, for sharing services to work you will need access to regular cellular data or Wi-Fi connectivity.